Maura Dooley - Poetry Live! 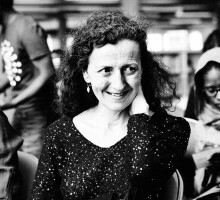 Maura Dooley has published a number of poetry collections, including Explaining Magnetism (1991), Kissing A Bone (1996) and Life Under Water (2008). Her work has gained awards on several occasions. In 1987, she won the Eric Gregory Award. In 1997, her poem ‘The Message’ won the Forward Poetry Prize. Both Kissing a Bone and Life Under Water were short-listed for the T.S. Eliot Prize.